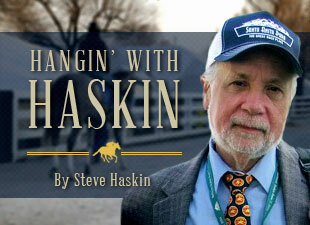 As part of the Blood-Horse's 100th anniversary issue on Aug. 6, I have been asked to list (with links) my 15 favorite Hangin With Haskin blogs. This was an extremely difficult task, as it's like choosing which of your children you like the best. Here are the 15 I have come up with, in no particular order, and the reasons why each was chosen. Below that, I have listed my favorite race recaps, which I felt should be separated from the more traditional personal/feature/commentary blogs. Although many of the blogs are fairly recent, several of them first appeared years ago, but have been reworked and expanded in order to tell the story more completely. This has always been one of my favorite articles, first appearing as a magazine feature in 2002. I spent the day in Doswell, Virginia visiting with Secretariat’s old grooms when he was baby and paying a visit to the farm and seeing his old stall and where he trained. It was an exhilarating experience, but very sad to see what has happened to the farm over the years and how his grooms drive by it all the time, but hadn’t gone in for many years, until Charlie Ross showed me around. I was thrilled when this story was awarded first place for best feature by the American Horse Publications. It was Peyton Manning’s farewell speech that inspired this column about my memories of covering the Kentucky Derby for so many years, and led to similar columns about the Preakness and Belmont Stakes. It was so much fun looking back at all those memorable moments covering the Triple Crown, beginning back when Joe Hirsch called the editor at DRF and told him, after 38 years, he no longer was able to do “Derby Doings,” and to give to me. That was quite an honor to say the least. This was my follow-up to “My Peyton Manning Speech,” in which I recalled the many special moments I had covering the Preakness, the most fun race of the three Triple Crown events. I also provided some little known history of the race’s origin and the horse for which it was named. None of the three Triple Crown races provided as many emotional moments as the Belmont Stakes, from the incredible highs to the incredible lows, and in this column I recall many of those moments, culminating with American Pharoah’s electrifying victory, the last Triple Crown race I would cover, and a most appropriate closing act. I could have chosen any one of a number of blogs on Zenyatta, but I selected this one because it transcended racing and showed how deeply Zenyatta affected people’s lives in such a profound way it was unlike anything I’ve ever seen. This is the blog I ran last week to introduce the Top 15 blog. I chose it because of the raw emotions it brings out, while providing the reader with an in depth look at racing’s only undefeated Triple Crown winner and the melodrama that ensued. It is the quintessential fairy tale gone bad. But the dynasty Slew built still lives on. This was so far removed from a racing blog, even though it takes place at Belmont Park. I decided to drive there the Saturday following 9/11 to see how racing was coping with the greatest American catastrophe of our time, just miles away from the track. This is my account of that visit, which I believe is the most profound piece I’ve ever written, because of how difficult it all was to absorb…a bombardment of emotions. This still is the greatest story I’ve ever encountered and forever linked me to the most amazing Cinderella horse of my time and his equally amazing – almost unbelievable – story. This first part covers Canonero’s background and his extraordinary journey to the Kentucky Derby. There is no way I can include the first part of the Canonero story and not the remainder, so I am forced to use two spots in order to tell the story in its entirety. This one is strictly personal, as it recounts my 48 years going to Saratoga and all the memorable moments that transpired there, not only for me, but my family, for whom the Spa also remains a magical place. This is where I proposed to my wife and celebrated my daughter’s first birthday. It was also my first trip away from home and instilled a true sense of racing history and helped thrust me into a new world and a new life. Through the years I have been requested to reprint this story on several occasions, and for good reason. It should be repeated to remind people of what the Thoroughbred is capable of, and of a time when they were tough as nails and ran their heart out regardless of how insane a schedule they were subjected to. The vast majority of racing fans never heard of Jim French, but they should, and that is why his story remains one of my all-time favorites. Sometimes statistics are so revealing and so remarkable they must be retold on a regular basis. Such is the case with Spectacular Bid, whose three-year career still is unrivaled in accomplishment. But with The Bid it’s not only about statistics. He played an important part in my life, my wife’s, and even my daughter’s, as brief as it was. Between the memories he provided and his sensational racing career, his story had to be included in the Top 15. I must return to that special summer of 1968 when I was a mere novice, lured into the Sport of Kings by two racehorses who remain to this day two of the true powerhouses of racing. Although I became a fanatic Damascus fan, both horses hold a special place in my heart, and I still get excited writing and reading about their epic battles in the Suburban and Brooklyn Handicaps, and the two larger than life characters who trained them. Aside from my early rooting interests that spawned my love of racing, I have never owed as much to a horse as I do to Invasor, with whom I bonded on a personal level and who would lead me and my family on a journey of discovery unlike anything we’d experienced before or since. He took us on an adventure of a lifetime, where we would meet new wonderful friends and share so many memorable experiences. That is why sharing those experiences and telling his story is a must, and why this list would be incomplete without it. I chose this blog because I had never undertaken a project like this. Trying to come up with a fresh new angle on this winning machine and two-time Horse of the Year, I decided to spend an entire day with him at Saratoga, beginning in the wee hours of the morning right up until his eagerly anticipated return to the races at age 7 following colic surgery only some three months earlier. It proved to be an emotional race, especially watching it with his owners, and quite a memorable day, beginning under the cover of darkness. I have to admit I also had a lot of fun writing the blogs “California Chrome Meets Mr. Peabody” and “Penny’s 92nd Birthday Party,” as they both were different and a bit offbeat, as was “Colors of the Mind,” inspired by a cloth napkin at Pimlico. And two others that need mentioning are my obits/tributes to two of the true legends of the Turf, Allen Jerkens (“Hail to the Chief”) and John Nerud (“The Legacy of John Nerud”), both of whom I was proud to call a friend. Below is a list of my 20 favorite race recaps -- the races and especially the back stories that are the most special to me. All recaps listed here can be found in the Bloodhorse.com search engine by typing in the headline of the story and my name. Phait Accompli (American Pharoah’s Belmont Stakes) – Knowing this would be the final Triple Crown race I would cover, I just had the feeling history would be made after 37 years of frustration. The unbridled jubilation was unlike everything I’ve ever seen or felt. American Idol (American Pharoah’s Kentucky Derby) – The beginning of the historic run and a great race as well. This story provides a good deal of background on American Pharoah. Pharoah Glow Brightens the Day (American Pharoah’s Preakness) – Part two of this unforgettable Triple Crown, especially watching the race with Bob and Jill Baffert and that monstrous storm that hit right before the race. Macho Grande (Mucho Macho Man’s Breeders’ Cup Classic) – The parallel stories of Mucho Macho Man and Kathy Ritvo remains one of my all-time favorite stories and so inspirational. Few results made me as happy as seeing him hold on for dear life in one of the most exciting finishes you’ll ever see. Roses for Smarty (Smarty Jones’ Kentucky Derby) – This was one of those years when I was in the right spot at the right time, and think I told the rags-to-riches story of Smarty Jones as well as it could be told. This was a Derby and Triple Crown to remember. Belmont Bird Call: Destiny Denied (Birdstone’s Belmont Stakes) – Although many people still can’t bring themselves to read about Smarty’s heartbreaking defeat, I really was happy with the way I told this story from both sides. Da Comeback (Da Hoss’s Breeders’ Cup Mile) – This actually is a lot more extensive than just a recap of the race. It is more of a feature, but it centers around one race, and I believe all the elements and behind-the-scenes details are here to make this an unforgettable story. Remarkable Rachel (Rachel Alexandra’s Preakness) – This had everything – history, drama, and one of the greatest, most brilliant fillies racing has ever seen. It was the first time a jockey gave up the mount on his Kentucky Derby winner to ride a filly in the Preakness. Rachel Rocks the Spa (Rachel Alexandra’s Woodward Stakes) – In 48 years, I have never heard Saratoga as loud as it was when Rachel returned to the winner’s circle following one of the most gut-wrenching stretch runs and courageous efforts you’ll ever see. The toll this race would take on several of the participants was unprecedented. Tiz and the Iron Horse (Tiznow’s 2000 Breeders’ Cup Classic) – Just a great story of two gutsy warriors and their epic battle that included a good deal of background material on this California-bred Cinderella horse who broke all the rules. Tiznow Wins For America (Tiznow’s 2001 Breeders’ Cup Classic) – This is almost an extension of the “View From the Verrazano” blog and how one horse and his extraordinary courage helped unite a nation, even in its own small way. This was about a horse who defended his country and simply refused to lose when all seemed lost. Bump and Run (Afleet Alex’s Preakness) – Even after all these years I still shudder at the thought of what might have been had Afleet Alex not picked himself off the ground after clipping heels at the quarter pole. His remarkable story, including that of his breeder and Alex’s Lemonade Stand, and his offbeat training schedule brings back memories of one of the extraordinary horses I’ve ever seen. One for the Ages (Blame defeats Zenyatta in the Breeder’s Cup Classic) – This story is similar to the Birdstone’s Belmont in that many of Zenyatta’s ardent fans still cannot bear to read about her devastating defeat. But the victor, Blame, should be rewarded for what he accomplished, and his owner Claiborne Farm’s story is one that should be told. This was a victory for history. Z One and Only (Zenyatta’s Breeders’ Cup Classic) – Santa Anita has seen few, if any, days that could match the excitement and emotion of Zenyatta’s dramatic victory, in which she became the first filly ever to win the Classic. The Ghost and Mr. Frankel (Ghostzapper’s Breeders’ Cup Classic) – After listening a fascinating conversation between Bobby Frankel and Ken Ramsey, and witnessing the street smart genius of Frankel firsthand, I rooted so hard for a Ghostzapper – Roses in May one-two finish, because I knew my story would almost write itself, as I had such great stuff. It could not have worked out better. Derby Launched Into Orb-it (Orb’s Kentucky Derby) – There was so much history behind the victory of Orb, it was similar to the story behind Blame. But having been weaned on the Phipps family horses back in the ‘60s, this was pretty special, and everyone was happy for Shug McGaughey. I also loved writing about the history of the Phipps and Janney families. Malice in Wonderland (Palace Malice’s Belmont Stakes) – I loved the story behind Palace Malice and his dam, and I was so happy for owners Cot and Ann Campbell and their wonderful family. Rejoicing with them after the race was pretty special. Wonder Woman (Rags to Riches’ Belmont Stakes) – There were so many elements and back stories it made this a very memorable race, but mainly it was about the race itself and the courageous performance by this brilliant filly as she out-battled eventual Hall of Famer and two-time Horse of the Year Curlin. No Nonsense (Street Sense’s Kentucky Derby) – This was one of the most popular Kentucky Derby victories ever, with Calvin Borel and Carl Nafzger, and the first 2-year-old champion to win the Run for the Roses. It was just a great feel-good story all around. Crafty Curlin (Curlin’s Preakness) – This was an exciting second chapter in one the most competitive Triple Crowns of all time that featured one of the most talented crops of 3-year-olds ever. Again, it was the story behind Curlin and his purchase, and the broken hearts he left behind that made this story special.